Is it just me or is it starting to get lighter again in the evenings? Maybe I'm just kidding myself but I can't wait until we get the long light evenings back - driving to and from work in the dark is a real buzzkill. Because of this lack of natural light during my working week stuck in an office I've been going on more walks at the weekends to take advantage of the light, but I've needed to up my layers and coats game to combat the chill. The problem is that I don't particularly like wearing a coat over a big cosy sweater as it makes me feel a wee bit claustrophobic and I find leggings the comfiest thing to go on long walks in, so I've been putting together more dress + leggings + boots + coat ensembles than ever. Obviously because it's me I haven't wanted to sacrifice style for warmth and comfort (I am sensible honest...) so I've been teaming together my favourite colours and textures and keeping myself extra snuggly with fur trims. 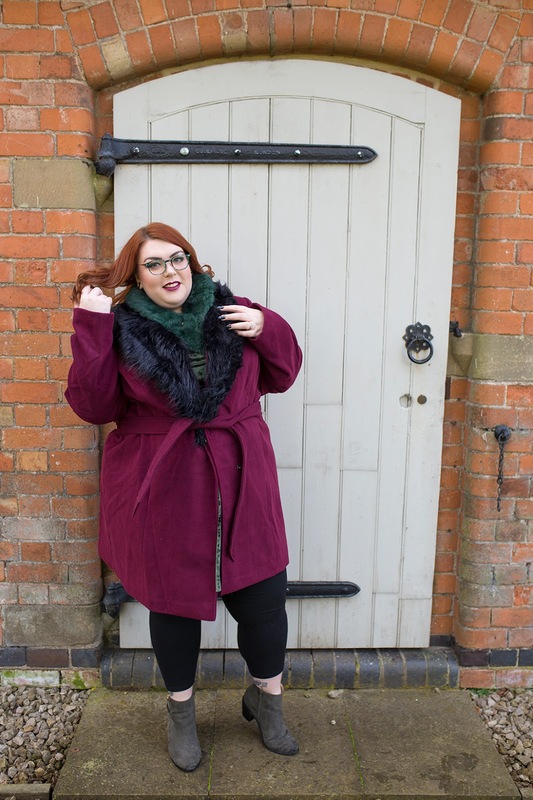 I absolutely adore the rich berry shade of this Burgundy Coat With Faux Fur Collar and Tie Waist (£39.59*) from Yours Clothing and have been wearing it several times a week since I got it - the fit is generous so it can be layered and wrapped around you more comfortably and its so easy to throw over pretty much anything for an instant glam injection. The faux fur collar has been keeping me extra toasty and the tie waist is great as it adds shape even over giant jumpers and thick jeans. 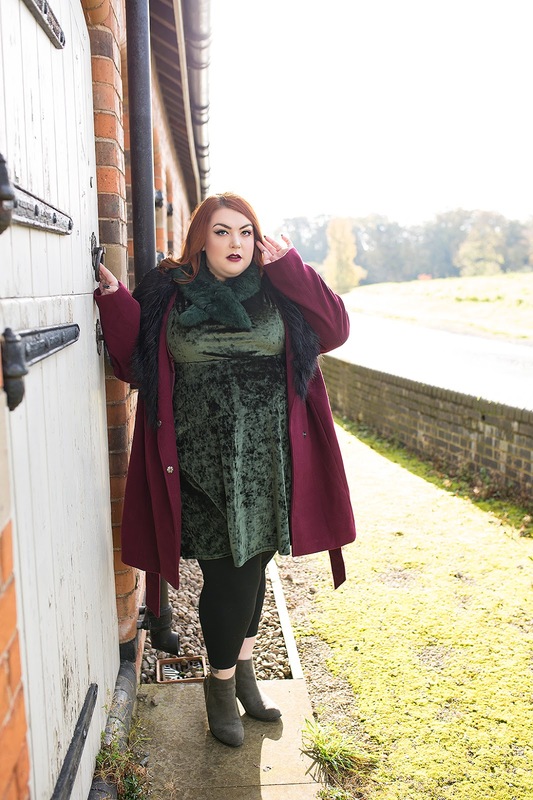 This lovely dress* was a Lovedrobe number that is sadly sold out, however there are lots of green velvet options available in plus size right now with a lot of them handily being in the sale as we're coming up to a season change and swapping decadent fabrics for more Spring friendly options. Unless you're me of course and always like to look a bit extra - decadent might as well be my middle name! A few options are this and this. PS if you're looking for some new specs I got this library chic green pair* from Glasses Shop, they have some really cute styles in at the minute and the prices are amazing!